This genus is accepted, and its native range is Mexico to Central America. 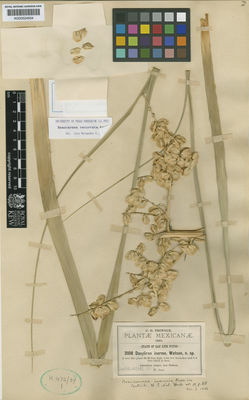 Beaucarnea recurvata (K.Koch & Fintelm.) Lem. Beaucarnea stricta (K.Koch & Fintelm.) Lem. Molecular phylogenetics and morphology of Beaucarnea (Ruscaceae) as distinct from Nolina, and the submersion of Calibanus into Beaucarnea (2014). Rojas-Piña, V., Olson, M.E., Alvarado-Cárdenas, L.O. & Eguiarte, L.E. Taxon 63: 1193-1211.